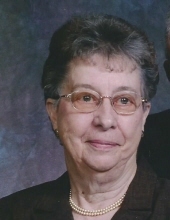 Louise Margaret Schemmel, 88, formerly of Dexter, passed away on Saturday, January 19, 2019 at Ramsey Village in Des Moines. Funeral services will be held at 10:30 A.M. on Wednesday, January 23rd at Zion Lutheran Church in Dexter. Visitation will be one hour prior to the services at the church. Burial will be at Dexter Cemetery. Memorial contributions may be directed to Zion Lutheran Church and sent in care of Johnson Family Funeral Home, PO Box 246, Stuart, IA 50250. Online condolences may be left at www.johnsonfamilyfuneralhome.com. To send flowers or a remembrance gift to the family of Louise Margaret Schemmel, please visit our Tribute Store. Luncheon will follow the committal service at the church. "Email Address" would like to share the life celebration of Louise Margaret Schemmel. Click on the "link" to go to share a favorite memory or leave a condolence message for the family.